Last Updated: January 30, 2019 · Published: June 19, 2017 By: Asian Caucasian 2 Comments This post may contain affiliate links or sponsored content. This weekend was definitely ideal for grillin’! Oh, the aromas of so many BBQs fired up all over the neighborhood! Just had to whip up something with an Asian flair that we could serve our guests, so why not Vietnamese Grilled Pork Tenderloin Skewers? 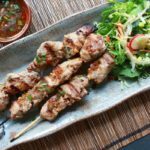 The marinade gives such amazing flavor to the pork (you can also substitute chicken or shrimp with this recipe) with hints of fresh ginger, garlic, and lemongrass. The pork is super tender when grilled and took no time at all to cook through. Serve these skewers with a side of our delicious Spicy Kale & Fennel Salad, which pairs so well with this recipe! All that’s left is a tall mug of brewskie and you’ve got yourself a great summer meal! 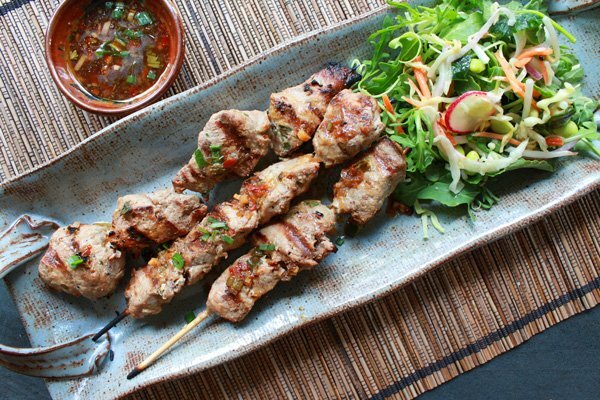 These super flavorful Vietnamese pork tenderloin skewers are so easy to prepare! 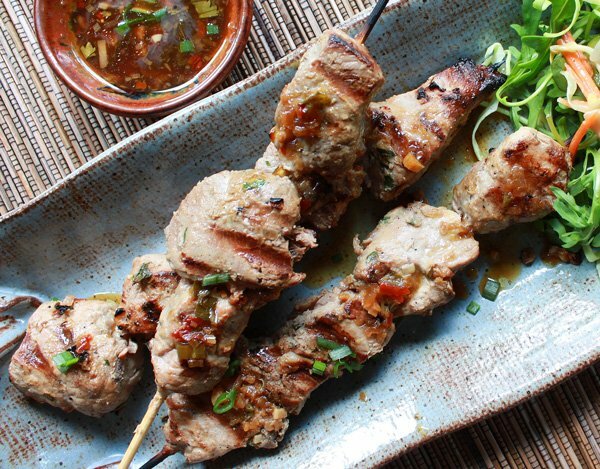 Vietnamese pork tenderloin skewers cook in only 15 minutes on the grill. Serve with a side of our Spicy Kale & Fennel Salad. For the marinade, place all ingredients up to pork tenderloin into mixing bowl and whisk to combine. Set aside a small portion of the marinade. Place the marinade in a large sealed bag and add the pork. Marinate at least one hour or more in the refrigerator. Remove the pork from the refrigerator and thread the pork onto wooden skewers that have been soaked in water for at least 30 minutes (this prevents the skewers from burning on the grill). Grill the pork skewers on medium high heat for 15 minutes, turning frequently. Meanwhile, place the reserved marinade in a small sauce pot and heat. Drizzle over skewers when ready to serve. Sprinkle with remaining cilantro. Serve with a side of Spicy Kale & Fennel Salad. Thanks so much for the feedback, Cheryl! I’m so glad your family enjoyed these pork skewers. I know that they’re a winner in my family too! Wow! I made these Vietnamese pork skewers for my family and their reaction was classic! I guess I’ll be making these from now on! Thanks for the awesome recipe!